The three “Fishing Ekdahls” Carl, Kris and myself, have had many fishing adventures together over the years. 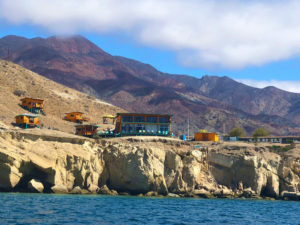 One of these trips was to Cedros Island about 4 years ago. 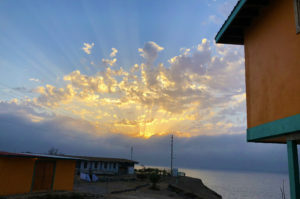 We stayed at the “Baja Magic Lodge” run by Cedros Outdoor Adventures. We went with friends who had been there before so we had an inkling of what to expect. 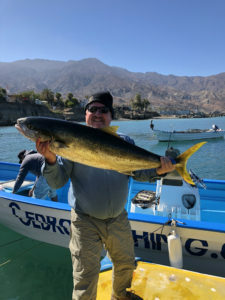 Our expectations were blown away with many quality fish caught including a 55 lb. 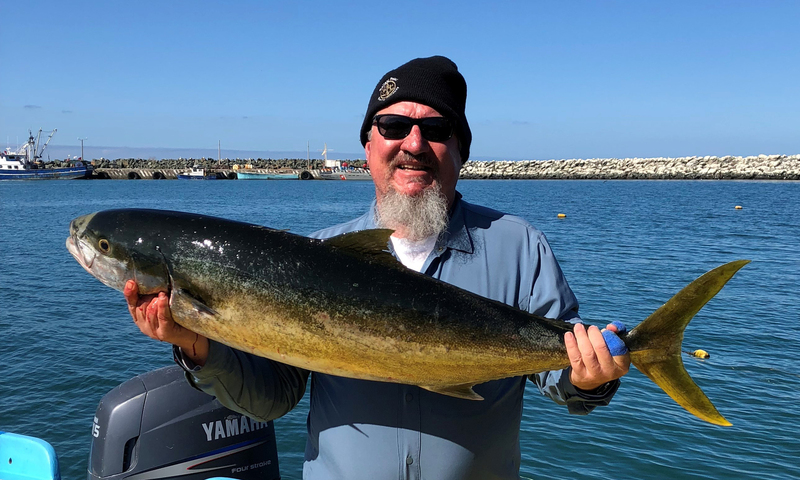 Yellow Tail caught by Carl. Many good memories were made and we vowed that someday we would return, this time for a longer stay. That someday was Tuesday 6/12/18 when Dad (he flew in from Santa Fe, NM earlier that day) and I drove down to Kris’s place in Vista for the night. We loaded up his van as much as possible before turning in. 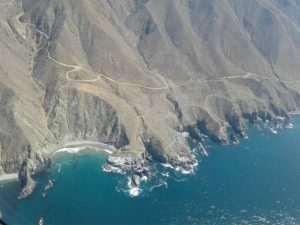 Wednesday morning came quickly and we were on the road to Brown Field by 8:00 AM, we had a later flight from Ensenada and the Cedros Outdoor Adventures (COA) van would be picking us up at 10:00 AM. COA had changed their travel arrangements since we last came down; instead of being picked up at a Starbuck’s by the border and then going to a long-term parking lot before the van ride to Ensenada, we were to park at Brown Field in Otay Mesa where there was 24-hour secure parking. 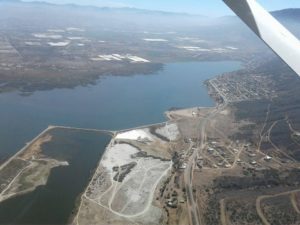 We would then enter Mexico at the Otay Mesa station. We followed the directions and parked where we thought we were supposed to and were pleasantly surprised to find an airport café open for breakfast so we would not have to go searching for food in the area. The “Landing Strip” was a great little café, Kris and Carl had the green chile omelet which they agreed were really good, I had my usual of eggs, bacon and biscuit & gravy. The airport facilities were clean and modern. After breakfast, we had one last thing to do in preparation for our trip which was to protect the rods for the plane flight. Kris brought pipe insulation and with a box cutter and duct tape we had three sets of three rods each all ready to go in just a few minutes. About this time our trip mates (there would be a total of only 5 anglers at the COA lodge this week!) drove up. 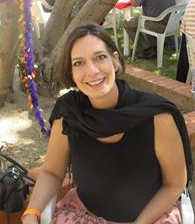 We knew we were in good company when we were greeted by “Are you guys going to Cedros? We are going to have such a great time! I can hardly wait!” With big smiles included they introduced themselves: Fred and Mike from Dana Point. These guys had been going to Cedros for a while, a matter of fact they had already booked three more trips with COA this year! It was obvious that we were going to have the run of the place with plenty of room to spread out in the van on our way to Ensenada. Our COA driver, Tony, showed up and was very gracious and helpful getting our rods and all of our other stuff loaded into the van. He expertly navigated the border where we applied for and received out tourist cards. 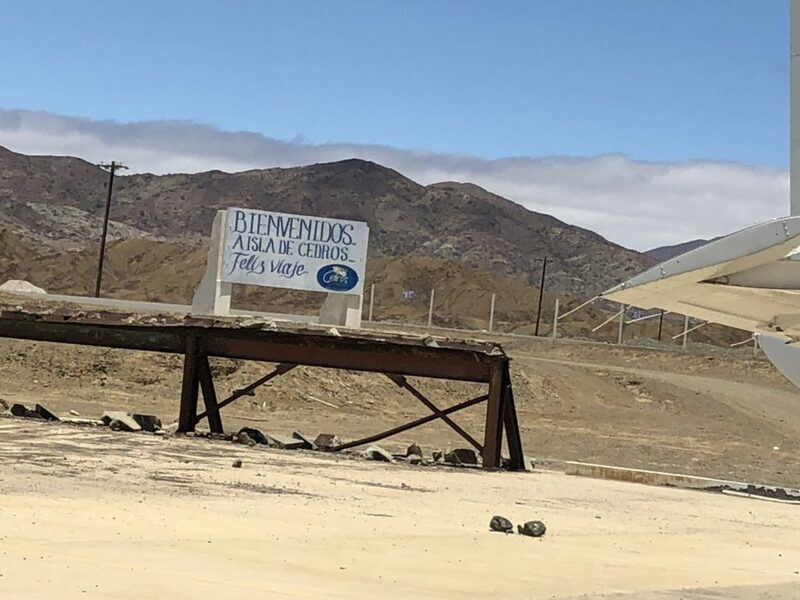 We did have to have the van undergo inspection which consisted of a giant X-ray machine on tracks going back and forth over about 5 vehicles at a time, this only took about 30-45 minutes and then we were heading south to Ensenada. 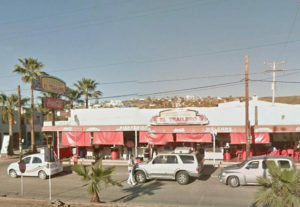 Fred had a favorite taco stand that he wanted to visit on the way down so along with the customary dollar-peso exchange we stopped at “El Trailero” for some fish, carne asada and carne pastor tacos with all of the fixings; the red hot sauce there was volcanic, just a warning. Be sure and stop there on your trip to Cedros, it is excellent! A part of the commitment to a trip like this is waiting at various point along the way, the border inspection, the luggage weigh in and payment for extra rods, the wait for the plane to arrive and disembark the passengers, loading our equipment, luggage, and supplies, the plane being refueled, etc. Patience is a real virtue and something I really have to work on. Knowing that great fishing with my brother and Dad were in the near future made it all worthwhile. 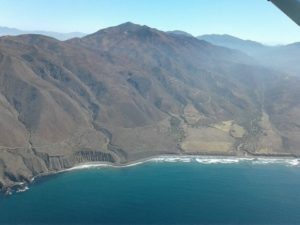 We finally were in the air and headed south to Cedros! 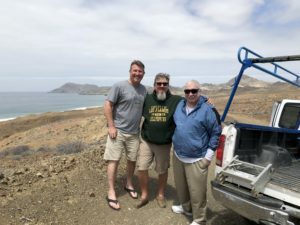 We made a nice landing at Isla de Cedros Airport and were greeted by the COA transportation/dock crew and the quickly and efficiently had us all loaded up and into the pick-up truck. 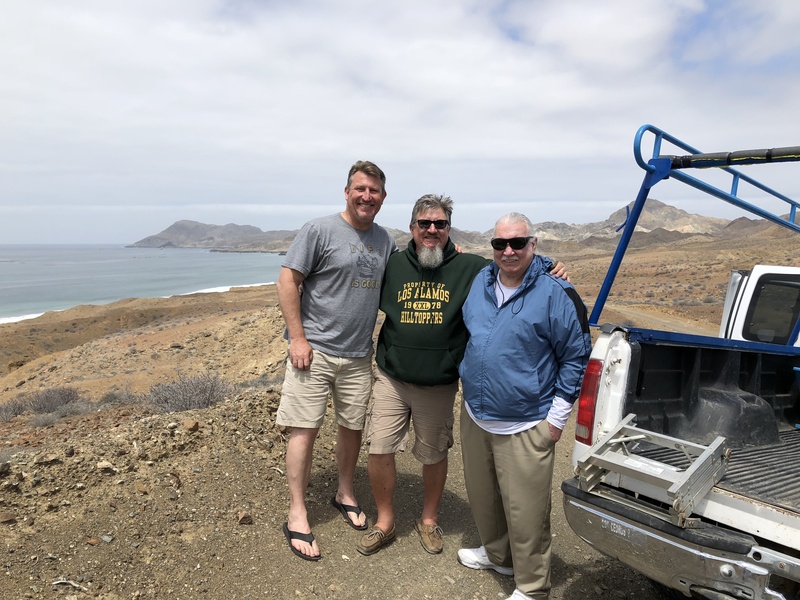 We made our way along the paved road past the Salt Operation town and village and then down a dirt road to the marina then back up a hill through a local neighborhood and finally past the local High School. I am going to take a moment to say that they could really use your donations in school supplies or money to buy the supplies they need. The school is somewhat dilapidated but classes were in session and the kids were in their uniforms… Back to the story. 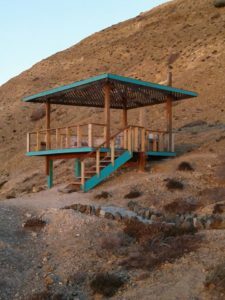 We arrived at the Baja Magic Lodge and were surprised to see three very colorful cabins being built with different stages of completion, with more on the way. Beautiful views of the Pacific Ocean were pleasantly unavoidable. We had requested room number 6 “Cabrilla” (Calico) before we found out that there were just two other people at the lodge this week so we asked Jose if we could take room number 2 “Fletan” (Halibut) downstairs so we would not have to deal with the stairs to the second floor… No problem whatsoever and they brought another bed in to make the room up for the three of us. We went about unpacking (we got beers first, of course) and settling in, we arrived too late to go fishing that afternoon so we took our time to get completely organized and moved into our new home for the next couple of days. We spent the rest of the afternoon enjoying the fantastic view, petting Fluffy, the resident dog, and admiring the angling skills of the resident Osprey who flew by three times during our stay with nice sized fish clutched in his talons… and yes, we had a couple of beers and a sip or two of tequila. 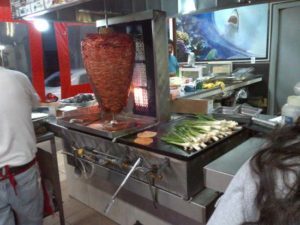 We heard the Dinner bell ring and it was great, served family style build your own burritos or tacos. Jose joined us for every meal and we had conversations about how the fishing had been and what to expect. We got our Pangero and panga assignments. 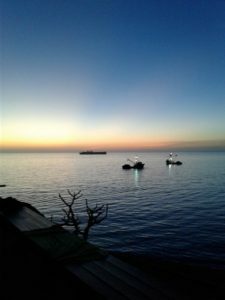 Our man was going to be Balam and the panga was “Chum-Chum.” It had been a long day so Dad hit the hay and Kris and I stayed up watching the sunset turn into a very starry evening; the constellation Scorpio was very prominent. We could see the glow of the Salt Operation behind a distant hill and we could hear the surf crashing on the rock below, very peaceful indeed. 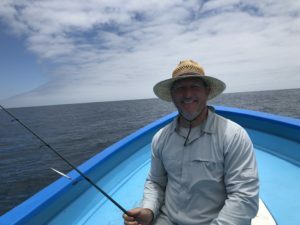 We gave up on the Yellows and we went way south and west to Punta Colorado where there are massive kelp beds and fished plastics and small metal jigs for Calicos. This was a different story, they were eager, hungry and feisty. Kris and I were up in front while Dad sat in the back. We were yelling “Hook Up, Fresh One or Double!” up in the front of the boat but Dad was bendo and never said a word, just sneakily bringing in three of the biggest Calicos of the trip! Over the course of several hours Dad caught around 40 to 50, Kris and I were both up around 60 to 70, we stopped counting, only stopping to take pictures of the biggest ones. We kept fourteen 2 to 4 lb. fish, just shy of our three-person limit, letting the largest fish go. Kris managed to keep his reputation for catching non targeted species going by catching one of the largest Sheepshead I have ever seen! We were joking about rock fishing at Cedros… Finally, the bite died as the wind shifted. Something we were somewhat prepared for was how cold it was, we had all been paying attention to the weather reports and the thought of packing sweats to go to Mexico in June seemed odd it paid off later. We headed back to the marina and I made sure that the dock crew knew to vacuum seal the catch, not ziplock. Back at the lodge we showered up and relaxed with some tequila shots for a few minutes before the dinner bell rang. Once again a very nice family-style meal proceeded by soup was on the table, the food as good and plentiful. We talked about our day with Fred & Mike and they had gone directly to Punta Colorado and both had 100+ fish, all catch and release. The sunset was gorgeous from the outer bands of clouds from the distant hurricane and soon the stars were coming out, Jupiter was prominent in the Southern sky. Dad headed for the barn and Kris and I soon followed. Once we were back in our room we stripped out of the wet clothes, took hot showers and put on comfy clothes. Next was spreading out our wet clothes on the patio, it was nice to have the place to mostly ourselves. Of course, the sun came out for the afternoon and we were glad of it to warm up with and to dry out our clothes. Kris and I walked down to the “beach” of large cobblestones and slowly made our way down to some larger rocks to try our hand at surf fishing. We both managed to catch big puffer fish; we could see a huge school of them but after the first couple they were no longer interested in our offerings. We relaxed the rest of the day and had another nice meal for dinner. Dad retired early and Kris and I once again watched the stars to the music of Pink Floyd Symphonic. Saturday was our planned “Day Off’ to go into town and tour the island. Dad decided to sit out the town part of the tour and would join us later for the tour of the island. Freddie drove Kris and me down the hill and into town which is very picturesque, lots of big trees colorfully painted shops and homes. We woke up the T-Shirt shop owner who would meet us later and in the meantime, we went over to Cedros Tackle where we met Christian. He opened the shop and we perused the selection of lures, he has deep diving Rapalas, not in Silver but very close colors. He suggested some swimbait colors that were working for him the other day so we bought a few of those along with some lead head colors we did not bring, and I sprung for the Rapala… after that, we went by the T-Shirt shop and bought a few souvenir T-Shirts and we were happy with our effort to stimulate the local economy. Freddie drove us down to the Malecon and marina and then up the main street of town. We took a few pictures and then headed back to the lodge to pick up Dad for the rest of the Island tour. 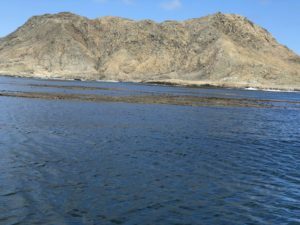 visited Campo de Punta Colorado where the Islanders set up a seasonal camp to harvest a form of seaweed from the ocean floor. They stuff it into net bags weighing a couple hundred pounds and then that is spread out on land to dry. They then compress and bale it to be sent to the mainland so that “agar” can be extracted for its many uses. Freddie had relatives and friends there and we caused an impromptu break in the action as everyone came over for a visit. They were proud of their operation and answered our curious questions. The location is spectacular and we were able to spot our friends Fred and Mike fishing the boiler rocks in the distance. 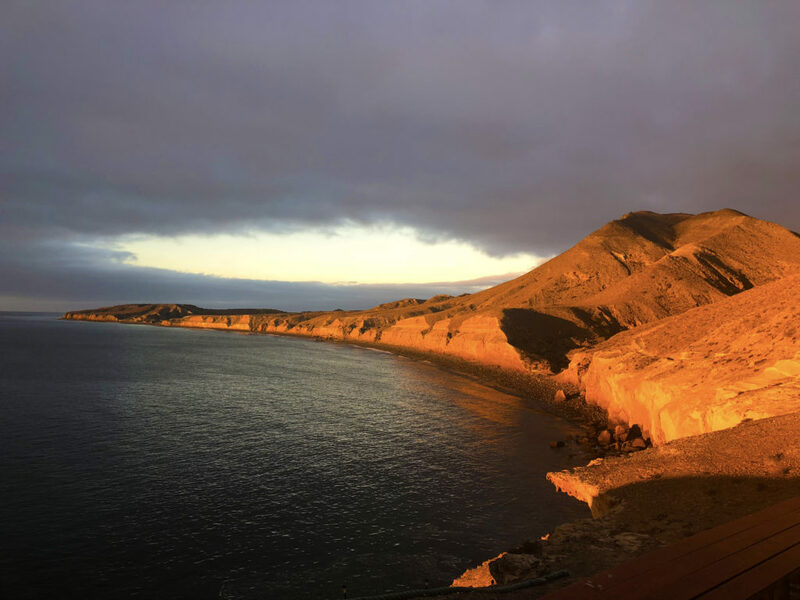 Next stop was El Wayle which is a more permanent village where there are two seasons for fishing, one for Abalone and the other for Lobster. There was hardly anyone around as it was a day off but it was very beautiful so we did the tourist thing and took plenty of pictures. Then it was a bumpy and exciting ride back to the lodge where we stretched out, took naps and then talked about our adventure to this point. 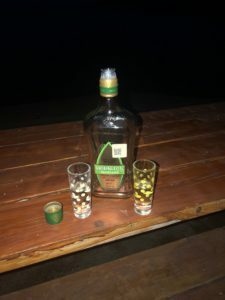 Our clothes were pretty dry by then so we got organized for a full day of fishing on Sunday and then the dinner bell rang and we fell into the same routine of enjoying a great meal swapping stories with the other anglers and an early evening of stargazing and tequila shots. We admiring how well we could see the constellation Scorpius when the International Space Station, or ISS, made a spectacular appearance traveling very fast from north to south, a real treat. We saw two more satellites and about half a dozen shooting stars later on in the evening. We turned with high expectations for Sunday. Alarms went off announcing Sunday had arrived! 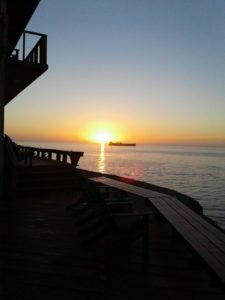 We got up got dressed and made our way to breakfast and coffee, just a little sore from the bumps and jumps in the road from the day before… we wandered up to the truck to go down to the marina and we greeted Ballam as we boarded Chum-Chum. Once we got situated and were leaving the harbor I pulled out my new Rapala and showed it to Ballam, he has a really great smile, he grinned and off to the Yellow Tail grounds we went. We had been trolling for about an hour when we got a hookup, my rod, my lure so I took the turn and let the fish run. It was pulling of lots of line and Ballam was backing down on it so I finally started to get some line back. Every time I thought I was gaining the advantage the Yellow made another run just to show me who was in charge. We were all laughing because this was what we were after… forty-five minutes or so later I had deep color and Ballam was ready with gaff and as suddenly as it started it was all over, 36+ lbs. of Yellow Tail hit the floor. I was beat and I was very happy! Ballam got it all cleaned up and we took some photos. We put the Rapala back out on troll and I told Kris and Dad that it was the best $4,200.00 Pesos I had ever spent! 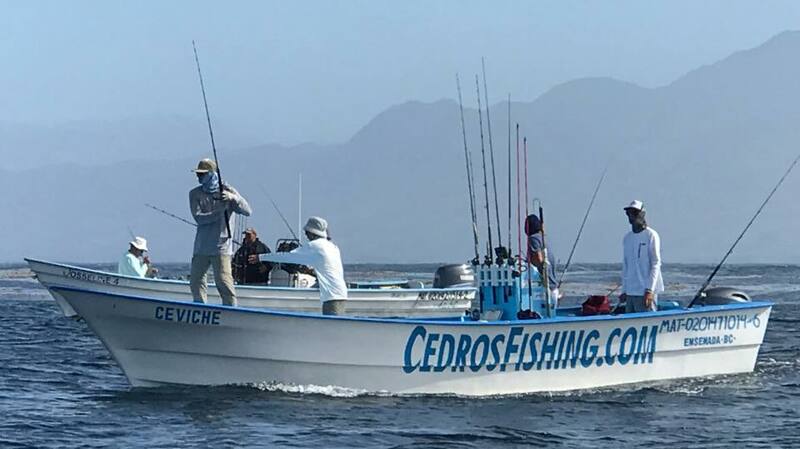 We spent another hour going back and forth in the pattern with no more hookups so we asked Ballam to take us back to Punta Colorado for Calico Bass. We used small jigs and plastics to catch fish after fish, it was so much fun! 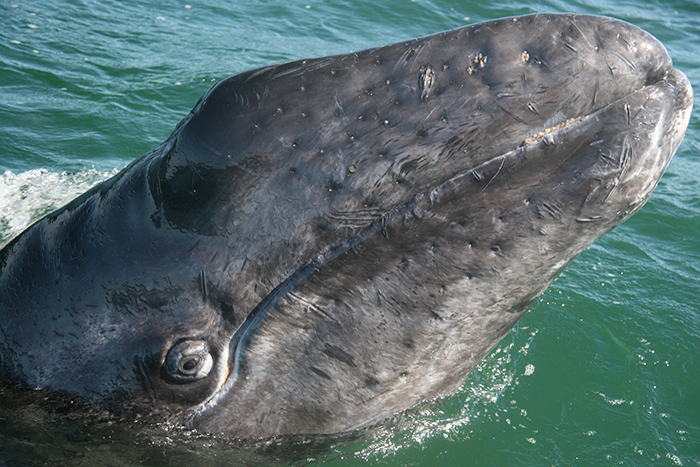 Most of the hookups were coming on the drop as the fish darted out from the kelp stringers to devour our lures. We were doubling up and even tripling up and just laughing, this is the action we had been anticipating. Again Dad was the back seat Bass assassin, catching several of the biggest fish of the day. To go along with all of the bass, Kris caught a couple of huge Sheephead (14+ lbs.) and I caught some White Fish that were the size of my arm! 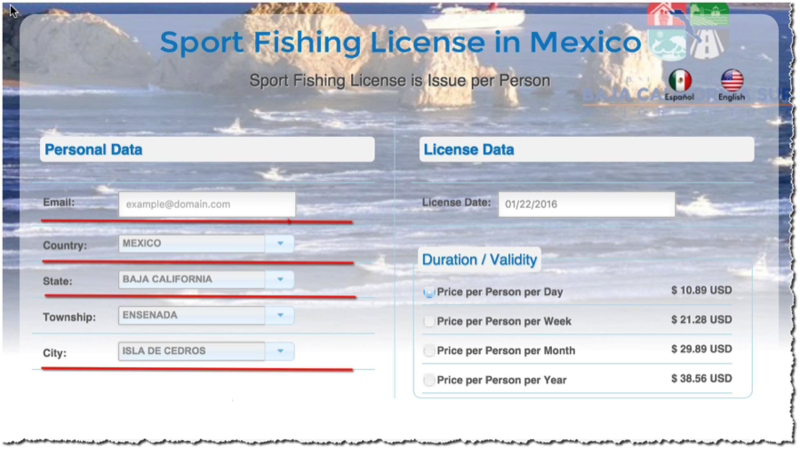 Just imagine rock fishing in Cedros! We were fishing in close proximity of our friends Fred & Mike and they were hooting and hollering when they hooked up too! We kept our limit of five fish, letting the largest bruisers go to breed the future generations of Calico at Cedros. As always happens, the wind shifted, the sun came out, the stars went out of alignment, something changed in the universe that put the fish off of the bite. We moved a few times and caught a couple more bass but nothing as awesome as that first stop. We decided to call it and head back to base. That evening we had the traditional final night Lobster dinner with all the fixings. Kris had big plate of Carne Asada as he has a shellfish allergy and it too looked very, very good. We traded our stories with Fred and Mike as usual and all agreed what an awesome trip it had been so far. 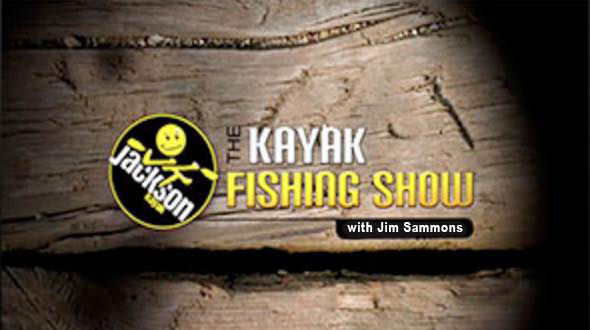 We turned in early as we wanted to get in our last ½ day of fishing on Monday before heading home; we had to be at the airport no later than 11:30 AM so we packed as much as we possibly could and tore down our rods and reels except for our Calico weapons. 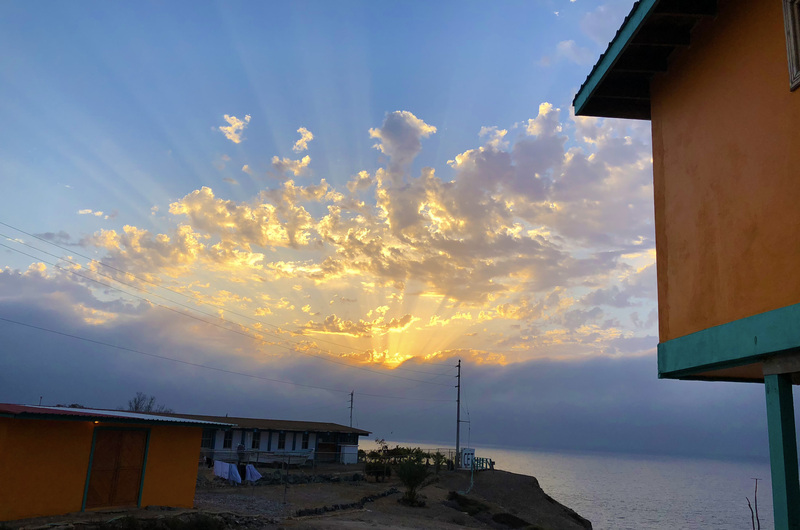 Sleep came easy after a week of Cedros Outdoor Adventures. Our last day started early, Dad opted out of fishing so it would just be Kris and I. It turned out to be a funky morning with the bite being off. We tried fishing the boiler rocks south of the Airport with no luck and we decided to go ahead and call it off early just give ourselves a little more breathing room as far as packing, etc. 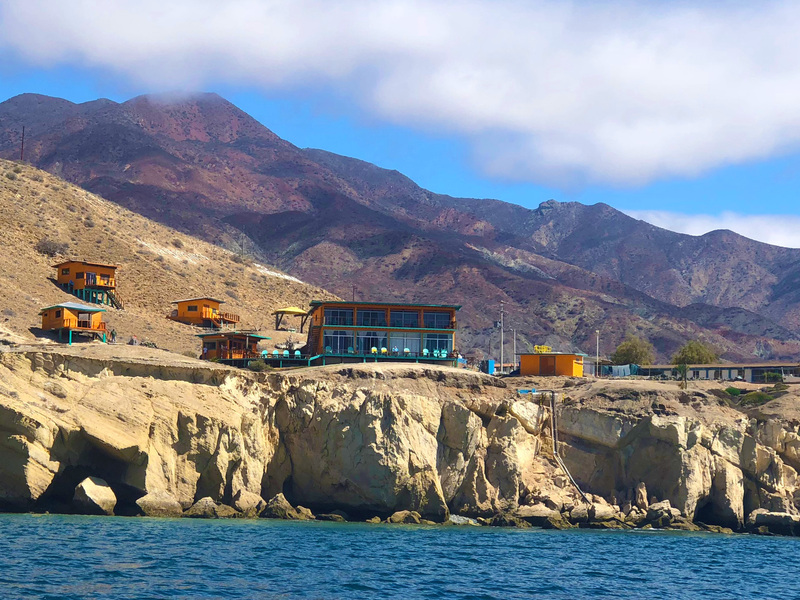 As we headed back to the Marina we asked Ballam to get us closer to the Baja Magic Lodge so we could take pictures of the lodge and the new cabins. It was a very clear morning and we were happy to see our Dad sitting out front! We got him to wave his arms and we took pictures of him, which would be a lasting image of the fun we had enjoyed at Cedros. The people, the food, the camaraderie, the natural environment, all of this made a great trip even better. I had been raving about the homemade salsa in the kitchen so of course, the girls brought out a jar for me to bring home! We petted the house dogs one more time and then said our goodbyes to Jose and Freddie and the dock crew. They loaded us and our gear up on the pick-up truck one last time for the ride to the airport. We did not have to wait long for the Cessna Grand Caravan to show up and unload its passengers. Our passenger load going home was very light, just us three, Fred & Mike a young mother and her child and a young man sitting in the co-pilot seat so we were all able to stretch out for the flight to Ensenada. I always want the window seat, there was no problem with that. Landing and getting our gear off the plane in Ensenada was very smooth and both Rowan and Carlos were there to greet us and get our report on the trip. Carlos brought his family and they were very nice. 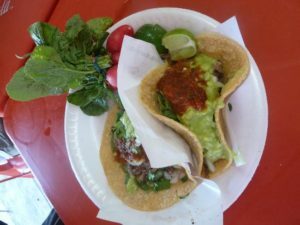 It was not long before we were on the road and yes, we stopped at El Trailero for tacos again, it was just as good as the first time! Watch out for their red hot sauce… Going through the border crossing at Otay Mesa was smoother than last time at Tijuana but because it was basically rush hour it was about 1-1/2 hours. We were very glad to see Kris’s van at Brown Field and transferred our gear and thanked the driver, said our good byes to Fred & Mike, used the facilities and away we went! It was the end of a great adventure but not the last time I will go to Cedros Island; the fishing and fun is just too good to pass up!